Save time on manual reports, eliminating the need to keep receipts. Reconciling receipts, cash disbursements to drivers, and sorting through credit card statements to allocate fuel and maintenance expenses can be a huge headache. However, with the FINISH LINE Universal Fleet Card system all tracking and managing of receipts and invoices becomes a breeze. Our invoices consolidate all fuel and maintenance transactions and we report on a calendar month instead of off cycles. We also have advanced summaries of your transactions by driver, card, fuel product, department, and even track tax information for state and federal government compliance and year-end tax information. 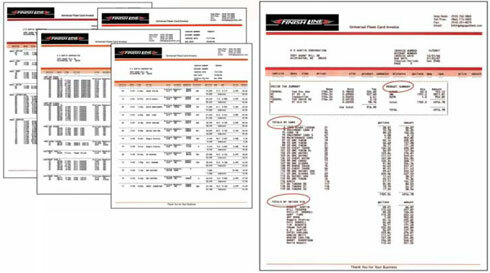 Our consolidated invoice shows you all your expenses for each vehicle. Your invoice will have key driver and vehicle statistics such as: Miles Per Gallon, Cost Per Mile, etc. We identify driver and vehicle information such as where fuel is purchased and what fuel grade is purchased. We bill on a calendar month from the 1st and the 31st with Net 15 day terms. You will receive an invoice for your transactions from the 1st through the 15th of the month. You will receive another invoice for the 16th through the end of the month. Both invoices have the same terms of Net 15 days. Draft option is available for customers who would like to make a reoccurring payment each week or would like their monthly total automatically drafted from their account on a specified date.